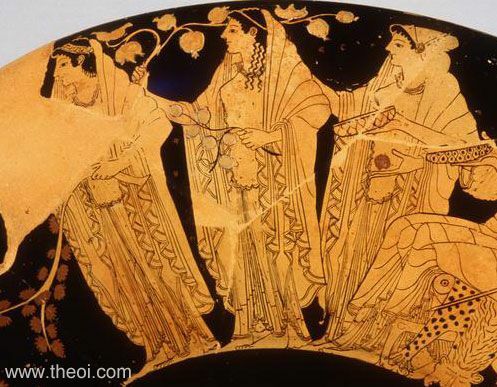 Detail of the three Horae (Seasons) from a painting depicting the reception of Heracles on Olympus. The three Horae each bear an attribute of the seasons--one holds a branch of spring blossoms, another the fruit of summer, and the third a small object (perhaps a winter seed). They stand before Demeter, goddess of the fertile earth (see other image).